A flat white. Flickr user Fraser Elliot. And stick around to chat with new friends. 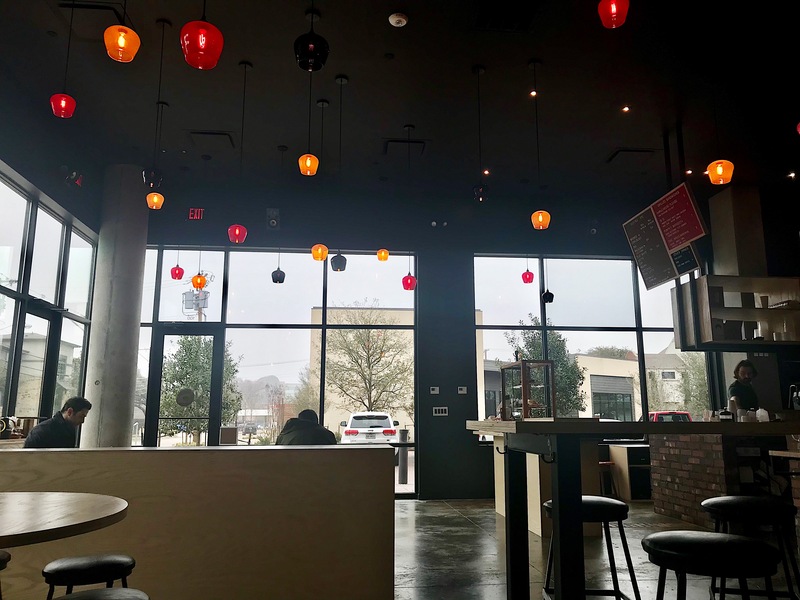 LDU Coffee, which is a new Australian coffee shop, opened on Fitzhugh Avenue beneath the B&F flats—and us Dallasites are in for a treat. I ventured over there early Wednesday morning in the hopes of trying out a couple of their selections. I opted for the flat white and banana bread to complement my espresso drink. I chose a seat on the burgundy booth bench stretched across the wall opposite of the entrance. It’s a no frills sort of place. Red and yellow and black light fixtures hang from the ceiling, but most of the light is natural, provided by the floor-to-ceiling windows. There are two long brick islands, one for the coffee magic and another from which customers can watch the baristas in action or use as a work surface. A glass case at the front counter boasts an array of bakery items. Brothers, owners, and operators, Adam and Mark Lowes, roast beans from White Rock Coffee, specifically of the Mexican single origin variety. So far, their most popular menu items have been the flat white, the “Magicman,” and the long black. And apparently Texas is not a huge culture shock for them. The banana bread: I’m a sucker for a warm, moist, faintly tart slice of banana bread. The flat white: It was frothy and strong, definitely enough to snap me out of my early morning, post commute stupor. The Magicman: It’s their original name for a cortado. The inclusion of sales tax: The price you see listed is the price you’re paying. No frantically trying to figure out in the checkout line whether you have enough change to cover that extra 23 cents. It makes the heart (and the wallet) stir with affection. The atmosphere: Some guests are working per usual but many are chatting amiably. The shop is enlivened by upbeat music that transports you to a holiday on the beach, perhaps along the Gold Coast or Sydney or Byron Bay. Suffice it to say I would be keen on another visit.